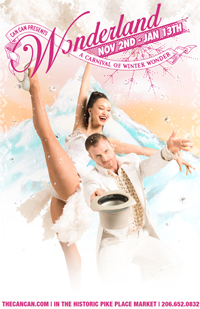 Can Can Culinary Cabaret is delighted to announce the return of our 4th annual winter show, WONDERLAND, to Seattle’s Historic Pike Place Market! This carnival of merriment glitters with the cheer of yesteryear. Can Can’s cast of professional dancers and singers swing from the chandeliers, mesmerizing audiences in an unrivalled intimate theater-turned-holiday chalet. Experience our tantalizing menu, carefully crafted with the best local and seasonal ingredients that Pike Place Market has to offer. 'Tis the season to eat, drink, and be merry in this wintry WONDERLAND, where our whimsical blend of music, dance, and theatre become your new holiday tradition.